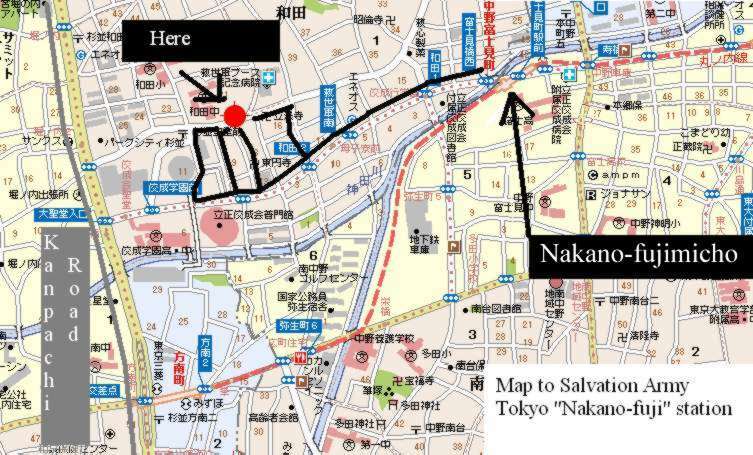 Train: The nearest train station is Nakano-fujimicho on the Marunouchi Line. There is only one exit at Nakano-fujimicho Station. When you get out from the station, turn left. Go straight until the 4th traffic light, which has a sign, "Wada 2". Turn right at this traffic light. Go straight until you reach The Salvation Army Booth Memorial Hospital. Turn left and pass in front of the hospital. On the corner on the right you will see a brick building, which is The Salvation Army Suginami Corps. Just past that is the Bazaar Centre, a 2 storey white building.